Description: Many misperceptions surround the spectacles held in ancient Rome, especially as a result of contemporary film and television. For instance, there is the popular belief that gladiatorial combats were the premiere spectacle at Rome: that they attracted the biggest audiences and the most partisan fans. In fact, neither assumption is true. The Circus Maximus in Rome – the original and largest venue for chariot-racing – was many centuries older and considerably larger than the Colosseum. 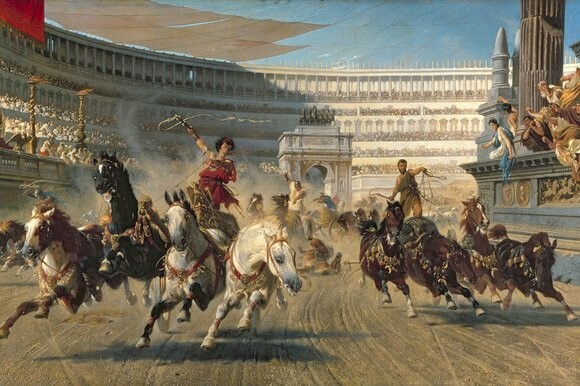 In addition, chariot-races drew the largest crowds and most fervent fans in Rome and throughout the Roman Empire, and continued to do so centuries after the gladiatorial games faded away. This lecture will explore the circus games’ activity and setting, their star performers, their spectators and fans, and the central importance of the circus games for Roman society as a whole. Dr. Sinclair Bell: is a Classical Archaeologist and Associate Professor of Art History at Northern Illinois, where he teaches courses on Greek, Roman and Egyptian art and architecture. He has excavated Etruscan and Roman sites in Italy and Tunisia and interned in museums in Germany and Greece. He studied Classical Archaeology at the University of Oxford, the University of Cologne, and the University of Edinburgh, where he received his Ph.D. in Classics in 2004. Since then, he has given nearly fifty lectures and published five books and more than thirty scholarly articles, book chapters and reviews about the art and archaeology of ancient Italy. All lectures are held on Sunday afternoons at 3:00 p.m. in Sabin Hall Room G90 on the UWM Campus (3413 North Downer, corner of Newport and Downer Avenues). On Sundays, parking is available in the Klotsche Center surface lot directly north of Sabin or on nearby streets. All lectures are free and open to the public and followed by refreshments. They are co-sponsored by the Departments of Anthropology, Foreign Languages and Literature-Classics, and Art History at UW-Milwaukee.